Hard to Bond to Plastics? How to Know What Surface is my Bath Tub? Multi-Tech Products offers surface repair kits that are factory color-matched. Please take note that most gelcoat and acrylic bathtubs and showers are either white, biscuit, almond or bone. Each manufacturer has variations in the tones of these colors. Easy to use Factory Color Repair Paste for bath tubs and shower stalls. Paste Kit has ample amount of Color Matched repair material to fill up to (3)-7” cracks or 3” air pockets (Blisters) or deep damage. Now, anyone can make professional quality home repairs to chips, nicks, scratches and surface cracks on sinks, bathtubs, toilets, shower stalls, ceramic tile, hot tubs, spas and major appliances. Prepare the chip, gouge or crack by using a grinding tool, putty knife, razor knife or other sharp tool. Be sure to create a "V" shape going throught the depth of the surface (color) stopping at the fiberglass structure - 1/16" to 3/16" deep. Wipe the area with a cloth or paper towel and use the sandpaper included to smooth out the repair area. Finally, remove all particles and clean area with acetone or nail polish remover. Your work area is now ready for Step 2. Dispense a desired amount of Poly Paste into one of the mixing cups included in the kit. Add 4 drops of catalyst per 1/4 ounce (16 drops per ounce - entire jar is 3 oz.). Mix the catalyst and the Poly Paste together using the smaller stir stick from the kit. Once this is done apply mixture to the repair area with the larger mixing stick. Be sure to over fill the crack or chip slightly. Your work area is now ready for Step 3. Wait one hour or until material hardens. At this point a heat gun or ordinary hair dryer can be used to speed up drying time. You will then use the sand paper so that the contour of the repair matches the surrounding area. Using a soft cloth, (or a buffing pad if preferred), and the supplied rubbing compound, hand rub area to polish and blend in the repaired area. Your repair is now finished. 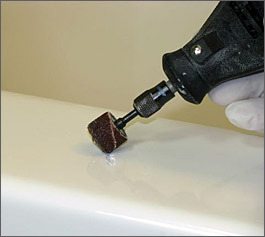 For harder surfaces or larger repair areas, a dremel tool or drill equipped with a grinding bit may be necessary to achieve optimum preparation. 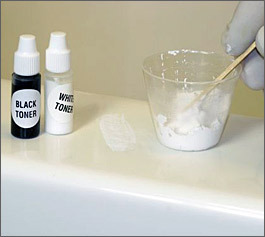 Toners are used for shading the Poly Paste color darker or lighter when the color needs adjustment especially when pure white is used as a starting point. Before adding catalyst to mixture add desired amount of Poly Paste in mixing cup provided. Adjust color by adding 1 drop of white or black toner and mix in thoroughly. Check color then add more white or black in small amounts until desired color is achieved. Then add catalyst to mixture. For best results wet sand with wet/dry sandpaper and water (220, 320, 400, and then 600 grit sandpaper.) Note: Drip water onto the sanding area with a wet rag while sanding. Machine buffing is acceptable using an automotive quality buffer and supplied rubbing compound. Recommended speed is 1800 to 2800 RPM. 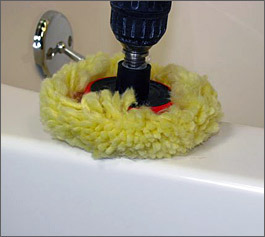 The picture illustrates a drill with our mini buffing pad set up. Use proper ventilation, open windows and wear latex gloves. Avoid contact with skin and eyes. 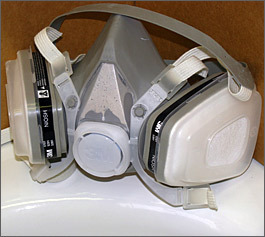 When spraying coatings and where no ventilation is possible in confined areas, an organic respirator is recommended. Light and Dark Toners - 1 ea. Available Kohler colors in above color swatch are as follows:White, Earthen White, White Satin, Ice Grey, Biscuit, Mexican Sand, Almond, Igneous Black, Sandbar, Sunlight, Thunder Grey, Cashmere and Biscuit Satin. Plexus bath tub, spa, shower and plastic cleaner. Ideal for cleaning and polishing repaired and refinished areas as well as maintaining a luster finish. Click here to add to order. Note: All shipments with a retail price tag over $19.00 USD going into Canada will incur duties and taxes apart from the shipping cost. Payment of duties and taxes will be payable directly to the carrier and will be assessed as a brokerage fee. These fees usually range between $20.00 to $25.00 USD. Although the color was not an exact match (a little bit lighter), it was close enough to really make you look to find the repair. The kit itself was easy to use and contained everything necessary to finish the small repair. We had a chip in a Kohler tub. Kit was very easy to use. Thought of sanding a tub was nerve wracking, but followed the instructions and the tub truly looks as good as new. Surface Repair website, ordering, and delivery are all excellent. Color wasn't an exact match but it wasn't a Kohler tub either, but it was supposed to be a Kohler color tub by a third party. Good kit for the money, plenty of material for many small ding type repairs, and it included tint to deal with the color match issue. I had what some would call small scratches in my brand new soaker tub--left by the contractors installing fixtures. This product worked perfectly to make the tub look like new. Thank you! The putty matched at the top of the tub but did not look right when I did the repair. It seemed off. It weirded me out. Final repair looked good when I glossed it up. Purchased this product to fix a couple small dings in my shower floor. Easy to use and the biscuit color was perfect without tinting. Good product. Excellent color match, didn't need to use tint, however it was nice to have it available. Would definitely recommend this product. I am a home repair professional, I ordered the product Surface Repair directed that was a factory matching color. Thankfully, the kit includes color adjusting tints. I followed the instructions which were straightforward and worked well. I feathered the patches to have no outline where the repair was completed. Attempting to match. You might say the top was dirty however this tub is brand-new unused and cleaned to their instructions with acetone. Aside from color challenge, product is easy to use mix and comes with all tools required to complete the repair. Did not expect perfect results in repair. However it is better than having a chipped tub. The rubbing compound worked perfect to bring back the shine that was removed during the repair process. All in all good product fair price and would use again for customer jobs. 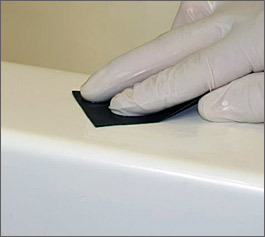 Repairs on acrylic tubs can have color variations in lower parts of the tub. Sometimes lot to lot of tubs vary in color as well. This is why we created this kit for color adjustments. The color starts with Kohler standard match. The toners adjust the paste to get to the changed areas. We appreciated the continued use of our product. Kit had enough for a couple of repairs, had a tiny area to fix. I filled it once and let harden. Should have read instructions and checked the color first round. Glad it had tints. was able to match it... kit had everything!!! Quick and easy to order. Good and accurate directions. Very easy to use. Color quality excellent. Click the button below to add the Kohler DIY Bath Tub & Shower Repair Kit to your wish list.